Figure 1 Hall number nH=1/|eRH| versus temperature for a series of Co-doped BaFe2As2 single crystals whose positions in the phase diagram are indicated by arrows in the inset. The multiband nature of the iron-based superconductors is a key factor to understanding their physical properties. 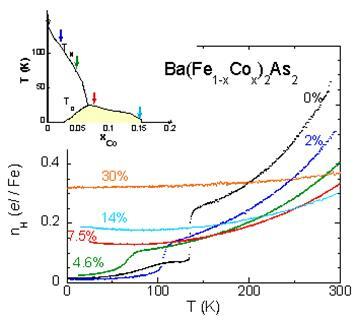 We have performed a complete study of the charge transport in Ba(Fe1-xCox)2As2 single crystals, in connection with a determination of their electronic structures by photoemission experiments. In the new Fe-based pnictide superconductors discovered in 2008, the appearance of high-Tc superconductivity in close proximity to the antiferromagnetic phase has been taken as the signature of unconventional superconductivity. It seems now well established that magnetism and superconductivity are directly connected to the peculiar features of the electronic structures of these compounds, which are characterized by small hole and electron pockets. The transport properties of the prototypical Ba(Fe1-xCox)2As2 have been studied throughout the electron doped phase diagram as fine tuning of Co content can be achieved in sizeable single crystals. 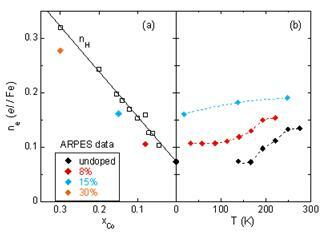 Figure 2 Number of electrons determined by ARPES as a function of (a) Co doping and (b) temperature. One can see in (a) that the values of ne measured by ARPES are in excellent agreement with those of nH. In the parent compound BaFe2As2 for which electron and hole contents are identical (n=ne=nh), the Hall coefficient RH is surprisingly negative, indicating that electrons dominate the transport properties. The same observation is found for the Co-doped samples. An analysis of the resistivity ρ and Hall coefficient RH in a two-band model allowed us to conclude that the holes are highly scattered and thus not directly visible in the transport properties. This suggests that the temperature dependence of the Hall number nH=1/|eRH| plotted in Figure 1 comes from the T dependence of the number of electrons. This was confirmed by Angular Resolved Photoemission Spectroscopy experiments (ARPES) on the same samples. As seen in Figure 2a, the number of electrons ne determined by ARPES is in a very good agreement with the values of nH measured at low T by transport. Moreover, the electronic structure considerably evolves with temperature resulting in an increase of ne with temperature (see Figure 2b). This evolution can be partly explained by thermal excitations among the narrow bands of these compounds.